경주 남산 동쪽 기슭 부처 골짜기의 한 바위에 깊이가 1m나 되는 석굴을 파고 만든 여래좌상이다. 불상의 머리는 두건을 덮어쓴 것 같은데 이것은 귀 부분까지 덮고 있다. 얼굴은 둥그렇고 약간 숙여져 있으며, 부은 듯한 눈과 깊게 파인 입가에서는 내면의 미소가 번지고 있다. 이런 점에서는 인왕리석불좌상과 유사하지만 전체적으로 자세가 아름답고 여성적이다. 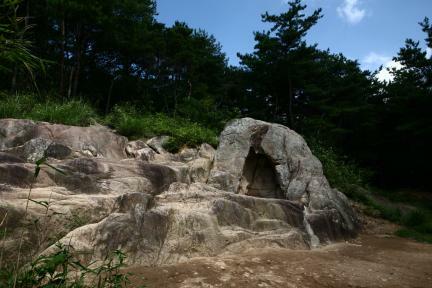 양 어깨에 걸쳐입은 옷은 아래로 길게 흘러내려 불상이 앉아 있는 대좌(臺座)까지 덮고 있는데, 옷자락이 물결무늬처럼 부드럽게 조각되어 전체가 아름답게 조화를 이루고 있음을 볼 수 있다. 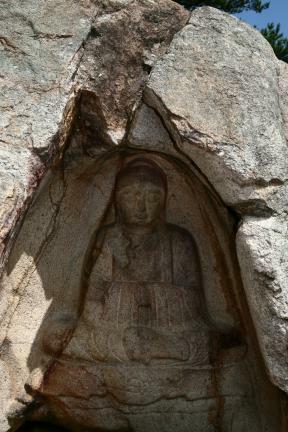 이 석불은 경주 남산에 남아있는 신라 석불 가운데 가장 오래된 것으로 삼국시대 후기에 만들어진 것으로 보이며, 이 불상으로 인하여 계곡 이름을 부처 골짜기라고 부르게 되었다. 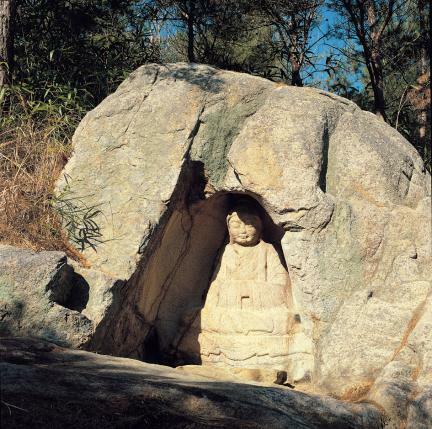 This rock-carved seated Buddha was carved into a one-meter-deep stone aperture in a rock at the eastern foot of Namsan Mountain in Gyeongju. 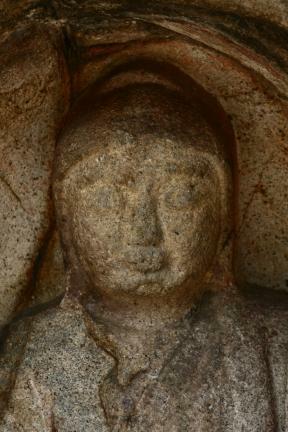 The head of the Buddha, which appears to be wearing a hood that covers its ears, is looking downwards; and a smile beams right across the round face, with its slightly swollen eyes and deep mouth. 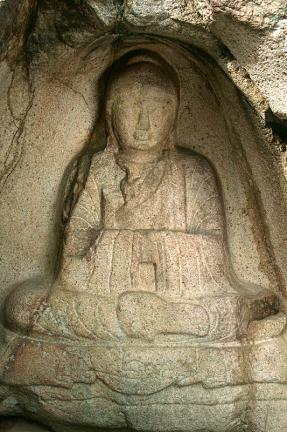 In this regard, it is similar to the Seated Stone Buddha in Inwang-ri, although it has a more beautiful feminine posture overall. 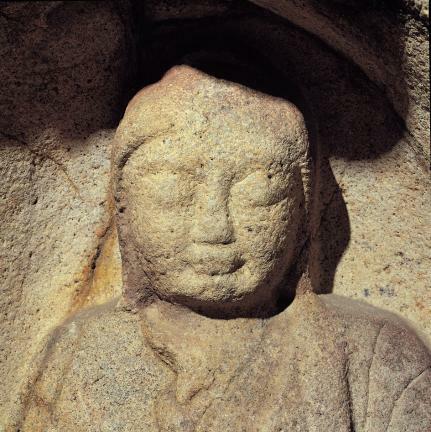 The clothing hanging from both shoulders to the pedestal is beautifully carved, like a wave pattern, forming an attractive harmony with the Buddha’s entire body. 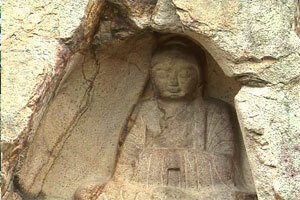 This rock-carved Buddha statue, the oldest of the Silla statues on Namsan Mountain, is assumed to have been made during the late Three Kingdoms Period. 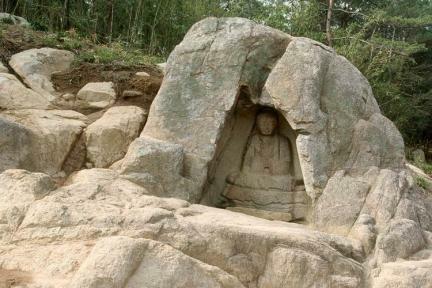 The valley is called Buddha's Valley owing to the presence of this Buddha statue.